So two months ago I signed up to do a Sketchbook Project. I didn’t start it until nine days ago and it has to be postmarked and in the mail by January 15th. I work well with deadlines. Yikes! What is the Sketchbook Project 2011? It is a group project (put on by Art House Co-op) whereby artists all over the world sign up and receive a tiny sketchbook in which to draw, paste, paint, sketch, etc. anything according to the assigned topic. Then the sketchbook is mailed back (on time or else it doesn’t get in!) and then put on tour across the US. Each individual sketchbook is assigned a bar code on its back. That bar code will allow anyone to look up the sketchbook online and look at it, if the tour doesn’t come to your city. Cool, huh? So I signed up. The topic I chose is Nightmares. I had lots of ideas in the beginning. My ideas didn’t make any sense when I worked them out. So I was stumped for a while. Until I came across something in a murder mystery I was reading at that time. It is the title of one of Goya‘s paintings: The Dream of Reason Produces Monsters. I’ve got two more pictures to go before I’m finished with what amounts to a picture book dummy. There aren’t any finished paintings or drawings, more like really rough sketches. Because the paper is like newsprint. But mainly because I’m scrambling to make the deadline. So I picture Goya, surrounded by his cats (I don’t actually know if he had cats but float along with me here). Next picture is the same only this time Goya has his head on his desk as if he has given up. The next few pictures are all of his paintings and sketches with cats here and there. 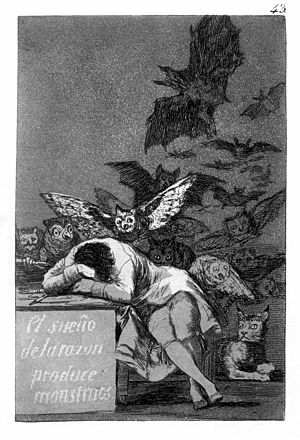 The ending shows Goya watching one of his cats sleep and wondering what cats dream about. Who doesn’t wonder what cats dream about? So Goya wondered, would they dream of things they eat? Perhaps things they would like to eat? Then he comes up with a wild thought that maybe “The Dream of Cats produces Mice”. This leads him to a brilliant idea for another painting, which he accomplishes. It becomes, of course, his most famous painting. All because of the cats. Which is all fictional. But you knew that. Previous PostHoliday Fishes Coming Your WayNext PostI HATE Exercise, Don’t You?